Mitchell’s story is a familiar one, according to the ”Out of Reach” report released June 8 by the National Low Income Housing Coalition (NLIHC). The report shows that, for those making minimum wage, there is no such thing as easy living. 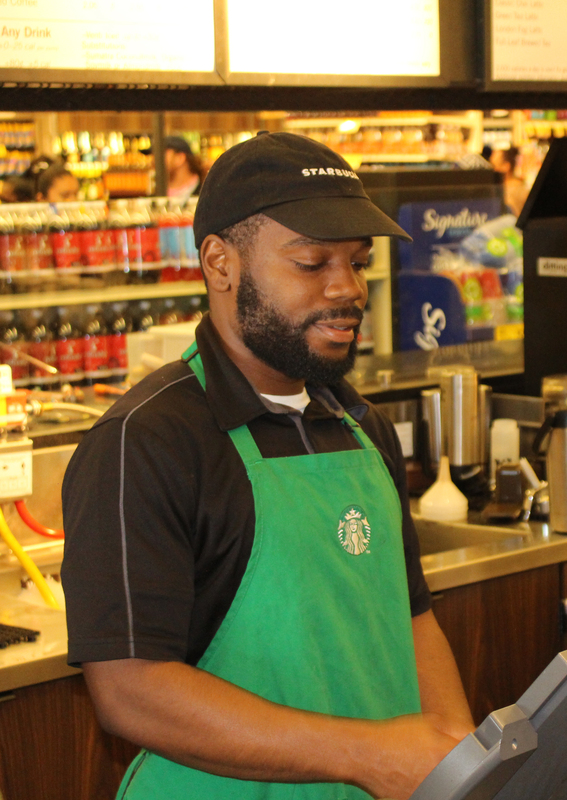 Gregory Mitchell serves a customer at Starbucks in Emeryville. Mitchell has to work two jobs in order to pay his bills. Photo by Brian Howey/Bay News Rising. Nationally, the hourly wage needed to afford a modest two-bedroom apartment is $21.21, nearly three times the federal minimum wage of $7.25. A one bedroom apartment would require $17.14 an hour to be considered affordable. Affordable, as defined by the report, is 30% or less of a household’s income. Although the national picture is bleak, California’s is even worse. 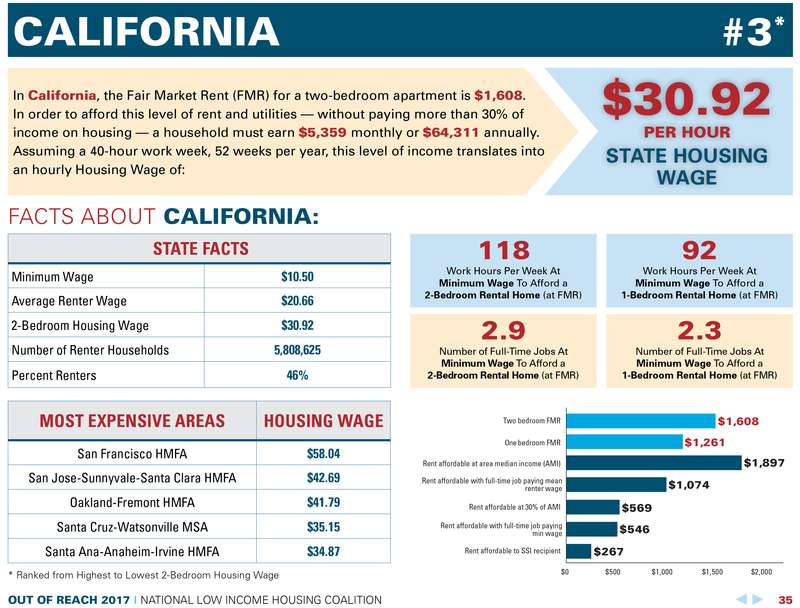 The Golden State has the third largest gap between minimum wage and affordable rent, behind the District of Columbia and Hawaii. Six of the ten most expensive cities in the United States are in California. A look at the most expensive urban areas in the country shows that the Bay Area hosts the top three: San Francisco, San Jose, and Oakland. In these cities, it takes an hourly wage of $58.04, $42.69, and $41.79 respectively to afford a rented two bedroom apartment. In San Francisco, the minimum wage is $14.00 an hour—a fourth of the two-bedroom wage threshold. Oakland’s minimum wage of $12.86 is less than a third of the $41.79 needed to rent an affordable two-bedroom home. 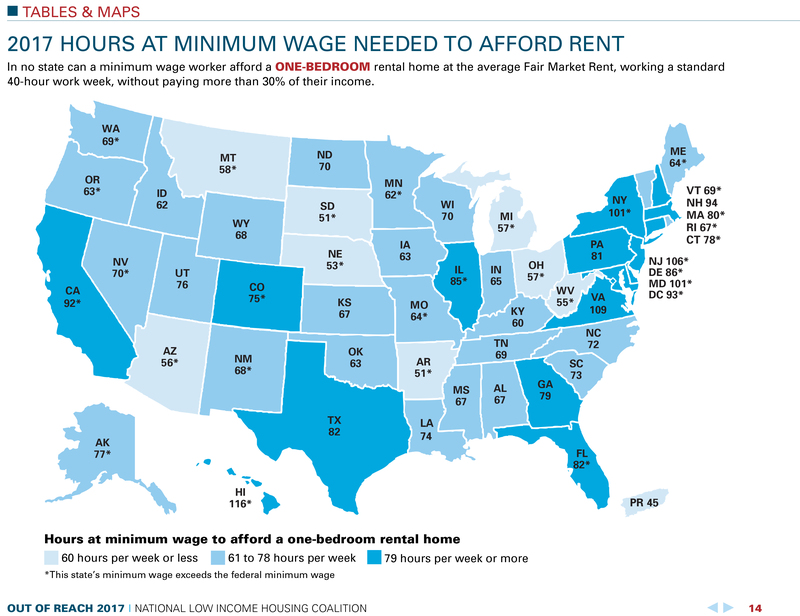 A map generated by the National Low Income Housing Coalition shows state-by-state average hours a minimum wage renter needs to work in order to afford a one-bedroom apartment. Courtesy of the National Low Income Housing Coalition. NLIHC President and CEO Diane Yentell said that policies providing affordable housing in America are realistic solutions to this problem, and should be made a priority. “The lack of decent housing affordable to low-income people is pervasive. The report highlights the urgent need for an increased national investment in more homes affordable to those lowest income people,” she said. But the Trump administration appears to be moving in the opposite direction. The proposed White House budget will eliminate every penny of the $198 million currently allocated to a federal program called the Housing Trust Fund (HTF), designed to assist low-income and very low-income households. The program, which just became fully operational in 2016, allocates funds to a majority of states for projects like construction of new homes, providing housing for the elderly and disabled, and transitional and permanent housing for the homeless. A table shows findings specific to California from the Out of Reach report. Renters earning minimum wage would either have to work 118 hours per week or earn $30.92/hour in order to afford a two bedroom apartment. Courtesy of the National Low Income Housing Coalition. Even workers earning better than minimum wage often struggle to get by. According to the report, the average renter in America earns about $16.38 an hour, leaving them stuck in the housing gap as well. Lorenzo Ortiz, 21, preps food for The Trappist, a popular Belgian-style bar in Oakland. At $14 an hour, he makes a bit more than Oakland’s $12.86 minimum wage. After the death of his father figure, he and his family struggled to stay afloat. Soon after he died, the family lost their home, and Ortiz has been “couch-hopping” at a friend’s house ever since. He manages to squeeze community college courses between two jobs, while living out of a friend’s living room. Luckily for Ortiz, his tia—or aunt—has set aside the art studio in her back yard for him. He plans to move in soon. Joining him will be one of his cousins, a fellow couch-surfer who also has been struggling to find a stable living situation. Although he works a second job at In-N-Out Burger, Ortiz doesn’t know if he will be able to afford a room without his tia’s help. “It might be a struggle,” he said. For those living on the bottom rung of the employment ladder, the “Out of Reach” report offers nothing new. The struggle to make ends meet hasn’t changed for them, and the threat of homelessness is still very real. Without higher wages and more affordable housing, the future for many low-income workers is uncertain. This entry was posted on June 21, 2017 by Bay News Rising and tagged Affordable Housing, Housing Gap, Housing Trust Fund, minimum wage, National Low Income Housing Coalition, NLIHC, Out of Reach, Wage Gap.